The County of Simcoe, Muskoka and Dufferin Orthophotography Project dataset consists of multiple remotely sensed data products including 30 cm resolution photos that were derived from digital aerial photography collected in April 2008 by First Base Solutions. These orthophotography encompass the following municipal tiers: The District of Muskoka (Town of Bracebridege, Hunstville, Gravenhurst, Township of Georgian Bay, Township of Muskoka Lakes and Township of Lake of Bays), The County of Dufferin, The Lake Simcoe Region Conservation Authority, County of Simcoe, The City of Barrie, The City of Orillia in the Province of Ontario. The Province of Ontario is only managing and making available a resampled 30cm version of this data. The corporation of the County of Simcoe and it's partners will utilize these orthos for land use planning, asset management, natural heritage studies, source water protection projects, surface modeling, watershed mapping, etc. The products from the project will primarily be used to detect changes in land use and identify assets for municipal land management purposes. Ownership of products and value added deliverables may vary by area and be negotiated with the specific partner agency. The digital orthophoto imagery tiles are provided in GeoTIFF and MrSID formats while the contour data is provided in ESRI Shapefile format. Both GeoTIFF and MrSID images can be accessed through image software that support these formats. Alternatively, Geographic Information Systems can be used to view the imagery and contour data within a spatial context. ; ESRI Shapefile; MrSID; Geo TIFF. Additional Time Period Information: The aerial imagery, from which the orthophotography and contour data was derived, was collected during April of 2008. 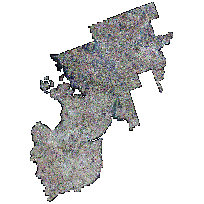 Throughout portions of the project coverage area, 10 cm resolution imagery was collected in 2008. This 10 cm imagery is managed directly by the partners involved in this data collection. Aerial Imaging: The orthophography tiles and contour data were derived from aerial imagery captured by First Base Solutions during April 2008.